“We are a collective of designers, architects and fabricators with a love of design and a passion for traditional sign making techniques”. Good design is key to everything Goodwin & Goodwin stands for. Based out of their 10,000 sq ft. workshop on the site of an old chocolate factory in North London, Goodwin & Goodwin has fast made a name for themselves in the world of Signage & Typography. They’ve been featured in countless design magazines and sites, on advertising agency walls, and their art graces the interiors of the hottest and hippest hotels and restaurants, private clients include pop stars, celebrities and even members of the royal family! Paul, one half of Goodwin & Goodwin, is making good use of his passion for typography and his award winning career as Creative Director for one of London’s top design agencies – to produce an ever growing range of covetable signs. Viviane is the other half of Goodwin & Goodwin runs the operations, and she hung up her global-roaming HR heels to focus on the quickly increasing demand for their signage. 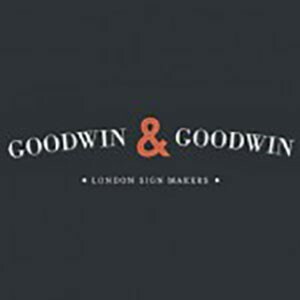 Goodwin & Goodwin support local people, most of their 18 staff live locally and they help manufacture the majority of all their products and signs within their North London workshop. This enables them to keep a close eye on quality and ensures they consistently deliver you the high standard of products they’re renowned for. Goodwin & Goodwin have won numerous awards including the ‘Craftsman’ award and ‘Architectural Sign of the Year’ as well as receiving Highly Commended for ‘Leisure Sign of the Year’ at the British Sign Awards.